When you make a donation to a children’s charity, do you know how your gift will help kids? At Canadian Feed The Children, we are as committed to providing high impact programming that changes children’s lives as we are to communicating back to caring Canadians how their donations help us get there. This commitment to financial transparency and excellence was recently recognized by the Financial Post in their annual report card where Canadian Feed The Children was named a top Canadian children’s charity. We know that financial transparency and reporting on the work our donors support in Bolivia, Canada, Ethiopia, Ghana and Uganda is essential to build trusting relationships with the Canadians who help make it all possible. It’s also why we can tell stories about children like Tigist. 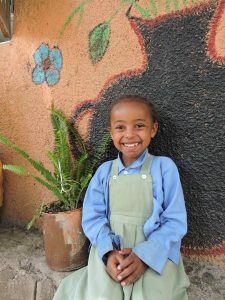 Tigist is a bright five-year-old who lives in Addis Ababa, the capital of Ethiopia – and she has benefited from the gifts that Canadian Feed The Children’s donors have made. When Tigist walks into her early childhood education centre each morning, she finds herself in a small oasis filled with gardens, a swing set and slide, private toilets, and happy murals painted on her classroom walls. She is greeted by a teacher who has been trained in early childhood education and who believes that Tigist is capable of many great things. She meets with her classmates who live in her neighbourhood and who have – just like her – come to school healthy, well-fed and ready to learn. Tigist is receiving what e very child around the world deserves: a safe space to learn and grow. But what you don’t know yet about Tigist is that she is growing up in a poor slum community. And that her parents can only send her to a school with trained teachers, a free school lunch, and a healthy learning environment because of Canadian Feed The Children’s donors. Tigist’s future is bright – just like those of many other children whose lives have been fundamentally changed because of the generosity of Canadians. The Financial Post chose Canadian Feed The Children as one of 23 top Canadian children’s charities of 2016 because of our commitment to financial transparency and to accurately reporting the work we do. We will continue to honour each donation we are given so that, collectively, we can all have the greatest and most sustainable impact on children like Tigist.